"What is happening in Detroit is a model for cities and states across the country..." Stand still little sheep, for you are to be shorn to the bone by your friendly state bankers. Not for Wall Street, but for the common need, of course. The Michigan legislature is debating a series of bills to impose a financial authority on Detroit that would remain in place long after the city emerges from bankruptcy. An unelected financial “oversight” committee, known as the Michigan Settlement Administration Authority (MSAA), would run the city for two decades, effectively usurping the local government. When the governor of Michigan installed Emergency Manager Kevyn Orr in Detroit last March, it was presented as a temporary measure, lasting 18 months at most. Now, according to the restructuring plan submitted by Orr, a bankruptcy lawyer with close ties to Wall Street, a new body “composed of individuals with recognized financial competence and experience” will have the authority to limit city borrowing and expenditures and tear up labor agreements. It could hardly be stated more clearly: the proposed body will be accountable solely to Wall Street. It will remain in power indefinitely and will not be subject to a popular vote or recall. The state of Michigan has been at the forefront of establishing anti-democratic forms of rule. Twelve Michigan cities and school districts—all ravaged by decades of deindustrialization, corporate tax cuts and financial manipulation—are currently under the control of emergency managers. Orr, who has described himself as a “benevolent dictator,” has outlined a plan to attack public employees, override constitutional protections for pensions, and hand over city-owned assets—including the Detroit Institute of Arts and the streetlight, electrical grid, and water and sewerage systems—to private interests and big investors. What is happening in Detroit is a model for cities and states across the country that are looking to unload pensions to pay off the debts stemming from the financial crisis of 2008 and the years of economic stagnation. “If this city gets it right, it’s going to lay a nice foundation for other cities, other municipalities to go forward,” said, Martha Kopacz, the “turnaround expert” hired by the bankruptcy court to review Detroit’s financial plan. As Detroit was driven into bankruptcy, the Obama administration explicitly rejected a bailout and opposed all efforts to block the intervention of the courts. The White House has given its full support to the bankruptcy, which it sees as a setting a national precedent for the destruction of the jobs, pensions and health benefits of public employees across the US. The naked rule of the banks, dispensing with political forms that can in any way be affected by popular pressure, is part of an international process. In country after country, newspaper editorialists, academics and other mouthpieces for the financial aristocracy are echoing the comments of right-wing columnist George Will, who declared last year that “self government has failed” in Detroit. In Europe, the so-called “Troika” of the European Commission, the European Central Bank and the International Monetary Fund has brought down elected governments as part of an unrelenting drive to wipe out public-sector jobs, increase the age of retirement, gut health care and pensions, lower minimum wages and introduce “labor flexibility.” This has been accompanied by the banning of strikes and the encouragement of right-wing and fascistic movements to suppress popular opposition. The banks are imposing a historic reversal in conditions for the working class in Greece, Spain, Portugal, Italy, Ireland and other countries, with joblessness, hunger and disease returning to levels not seen since the Great Depression and World War II. Meanwhile, the ruling elites of Europe, with the encouragement of the US, are rearming and preparing for a catastrophic military conflict with Russia. Behind the collapse of democracy is the immense growth of social inequality and the unprecedented concentration of wealth in the hands of a tiny minority of the population. Well aware of the deep working class hostility to its anti-social measures and growing increasingly anxious that the discredited political parties and trade unions will not be able to contain popular resistance much longer, the corporate and financial ruling elite is dispensing with democratic trappings and turning to authoritarian forms of rule. The Obama administration has overseen a massive expansion of police state measures, including NSA spying, drone assassinations of US citizens, and the frame-up of political dissenters. Its targets have included Edward Snowden, Julian Assange and Chelsea Bradley Manning, as well as anti-NATO protesters in Chicago and Occupy Wall Street protesters in New York City. What is happening in Detroit reveals the social purpose of these measures. Political forms are being restructured in accordance with the reality of social relations, which are characterized by an immense chasm between a super-rich minority and the vast majority of the population. The pension cuts and other austerity measures included in Orr’s plan of adjustment for Detroit are only the beginning. 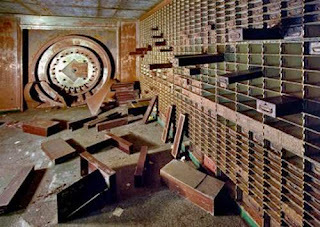 The Wall Street banks and their political front-men are preparing even deeper attacks in Detroit, as shown by the plans to establish a permanent bankers’ dictatorship. This Detroit precedent will be used to accelerate the social counterrevolution against the working class throughout the US and internationally.